In the following, I would like to report about my participatiton on a snow globe challenge which was originally intended by Auryn Beorn for her advanced students at Builder's Brewery in December 2011. Though I haven't had the chance to join her classes in the past months due to their scheduling in European late evening or night hours, I stumbled on a group notice of this school. Due to the "interdisciplinary" concept I felt thrilled to try it as well. For the whole background story, please read Auryn's own blog: Christmas Challenge and Winners. Aim of this challenge was to combine various methods and skills you can use in Second Life, namely building, sculpting, scripting (including particles, texture and prim rotations, illumination, music and controlling animations). All parts of the snow globe should be linked. Low-prim and low-script building was mandatory. Preferably, just one single script should rule the whole object. Not mentioned explicitely, but actually necessary was at least some additional texturising. The whole project should be completed within just 3 hours and 15 minutes! From my personal point of view, it is just impossible. Despite all my deep admiration and respect to Auryn, I disagree with this particular detail of the challenge. Why this rush? Creativity and especially quality takes time. Thus my first thoughts weren't so much with the four winners who made a great job for sure, but with the majority of participants who gave up long before the required tasks were completely fulfilled. They probably left the sandbox with the feeling that they have failed. I think that such narrow time constraints make slower learners feeling like "loosers" just before they have done the first step. What it is good for? I confess that I'm a slow learner, and I would have been among them who haven't managed the challenge in duly time. But are slower learners really bad creators? I'm convinced that this is not true! Thus I decided to participate "non-competitive", though the challenge was already over and the winners were announced. I just was taken by the general idea. My contribution should also be seen as a compliment to Auryn, my adored teacher and friend, as well as a statement for "daring slowliness" in the interest of a good result one can learn from and one can be proud of. The winner made it in 5 hours by using just 20 prims and one small but efficient script, so Auryn told me. She must be a goddess of knowledge and skills! I felt deeply impressed and a little intimidated. But my descision was made: I will create a snow globe in a very "Almutian" way, as my good old Swedish friend Jumal Jaxxon uses to denote my creations. He was it, too, who encouraged me to dare this adventure regardless if others might be much better and faster. On December 20, 2011, I studied Auryn's requirements and read carefully the steps she had defined. Some details remained still a bit unclear, so I asked back and added her replies to my (now German) specification. I cleared up my (virtual) living room to have enough working space and placed Auryn's slices on the wall in order to have them always in sight. Since preferably just one script should be used and a sit target to place the avatar should be destined, I decided to define the sit star on top of the snowglobe as root prim which will house the control script for all functions including the poses. In addition, this sit target should serve as a particle emitter for the snow flakes. I came to the conclusion that first building a prim cabin and then to sculptify it by the (for me not familiar) inworld tool Sculptcrafter cannot be literally implemented. So I had to invest some time in Blender to accomplish something halfways similar. Afterwards I checked some texture sources and selected some in a material folder for this project. As a quite rich source for winter terrain textures, I discovered the good old Linden Library folder Terrain Textures/Terrain Textures - Winter. Apparently this tedious but important step was not explicitely scheduled in Auryn's challenge. I think she announced the next step just directly after the time for the previous one had expired, so actually it cannot be really compared. In plain words: I already needed more time for planning and preparation than the whole contest was scheduled! I began to study the features of llSetLinkPrimitiveParams regarding rotations of linked prims and how to animate textures in a linkset. Auryn provided me an indication of llDetectedLinkNumber to make the key for the music box rotating. 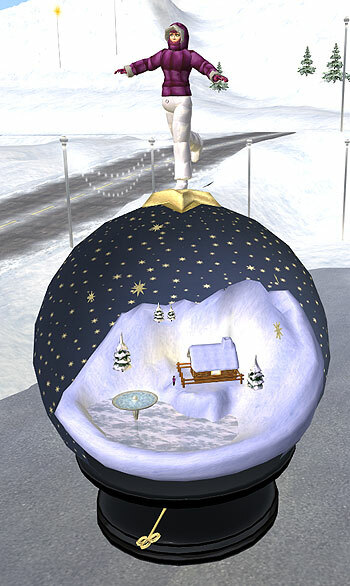 The very first version of the landscape inside the snow globe was a rough "testbed" with all elements to be influenced represented as simple prims. Later I replaced them stepwise by their final sculpted equivalents. In Photoshop, I designed a wintry background sky and applied it to the inner part of the sphere while I set the other sides invisible. I assume this was the only part of the whole project where I was able to undermatch the originally given timeframe. Afterwards I sculpted the fountain basin. Initially I began my work in Rokuro, but I switched over to Blender right soon. On this occasion, I found and fixed an error in my own Blender notes. Unlike in the original competition, I decided to place the cabin and the fountain not only on a plain cylinder surface, but in a sculpted diorama with some mountains and a small lake. 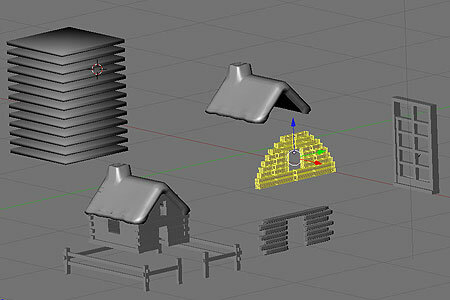 The cabin itself has been completely made in Blender by using the fractional sculpting technique explained in Gaia Clary's magnificent Machinimatrix ladder tut. Alone for this part, I needed three or four concentrated evenings to construct all the required parts for the cabin. The next evening was reserved for the star carousel which consists of just one sliced and rearranged Blender sculptie and another was needed to sculpt the key for the musicbox. Finally I sculpted a star as sit target on top of the bowl. This was quite time-comsuming, but I think it was worth the effort. My friends Nadja Straaf and Gabriele Drechsler helped me with explaining the way how to bend sculptie parts and to make geometric objects, respectively. Another new skill I learned in Blender was direct object painting which I have applied for colourising the sculpted fir trees. All these newly grasped techniques resulted in new tutorial pages for my own little Blender reference. Finally I finished the diorama with adding a mini version of myself, because Jumal objected that such a wintry landscape should show a trace of life and that somebody should be visible as occupant of the cabin. And I felt he was right. Beginning with the fountain, I added some particle effects to the landscape. Though actually just a temporary use of scripted particle systems was required in order to keep the script load low, I found a possibility to add snowfall and chimney smoke in the central control script by using the function llLinkParticleSystem. I have to admit that I'm not really a particles expert, so it needed a bit time for trial and error. Luckily, the free "EZ" particle generator HUD I already knew from Auryn's classes was a really big help. Two days later, I managed to extract the main idea from an impressive but for my limited purposes somehow "overequipped" multi pose sit script which I've found via the German SL Info forum. Actually I already had planned to create a menu-controlled pose system for a while anyway, so it was a nice side effect. My initially separately developed own sit script (I don't have any clue if Auryn's students have built something similar during the classes) is able to recognise up to 12 animations and to make them accessible via an assorted, usefully numbered menu. As to be honest, there occurred some unexpected problems with setting and especially changing of animation permissions shortly before the end of the project. Inkspots Voom and Elke Wylie, two experienced friends, were so kind and patient to give me advices in solving some problems and to review my code. Together we ironed out some errors in the single script which contains more than 460 lines in the very end. Making the static poses with QAvimator was the fun part, though it took a whole evening in order to find a common position for sit, lay and stand poses and to define it in the script. The last part of the scripting task was to integrate the musicbox function. Within two evenings, I accomplished cutting music by means of Audacity as well as to modify Auryn's basic script from her "Music!" class this way that it loops while playing. 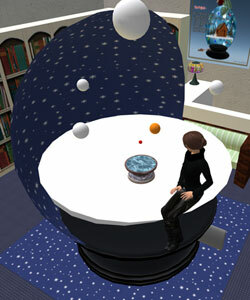 Changing between night (clear sky with a star carousel) and day (cloudy with falling snow) by touching the globe. Starting and stopping music which plays as a loop (taken from the licence-free web source Jamendo). The toggle switch for this is a turning key which also controls the light and smoke effect of the cabin. Playing Auryn's requested 6 which are selectable via an automatically updating menu whenever changes in the object inventory might occur. The snow globe project which I had begun as a seemingly limited task, revealed as the largest and most versatile project I tackled so far. The more I digged into all the details to be considered, the more my admiration for the few who accomplished all this in a couple of hours increased. On the other hand, I learned a lot for myself: Some new knowledge which I now partly share with others on my website, but especially about the value of friendship in Second Life when it means more than just a name in an endless list. For completing the whole snow globe challenge, I needed around 80 working hours. This is 20 times the granted time for the original contest! I think there is nothing wrong with it, because I still had fun all the time (though I interrupted work for five weeks in order to participate on a workshop for Machinima creation). Contests like this can encourage creative people to outdo themselves and to move their personal limits. Learning along a project is always an effective way to gather and to use new skills. And I personally look forward for other challenges like this, prepared with so much love by Auryn. Just I hope for the future that she might allow some more time to develop and to implement an own solution. Slower or not yet so advanced learners should get a really fair chance to accomplish all the tasks. © 2012 ff. Almut Brunswick. For personal purposes only! Due to legal reasons, I dissociate myself from all external links.